There is a restaurant in Savannah Georgia called “The Chromatic Dragon”. It is themed around the Dungeons and Dragons card game. The name of the restaurant refers to a specific character in that card game called the “Tiamat Dragon”. It is a super cool, five-headed dragon. Each head has a set of physical characteristics defined by the game. Each is a different color for example. The heads are black, white, blue, green, and red. Each has a different kinds of horns, scales, etc. I have been asked to make a five-headed trophy of this dragon for the restaurant. It was too big a challenge to pass up. I just had to make it. I’m pretty sure that the patrons of this restaurant will be highly critical of errors in artistic judgement or misinterpretations of the way these dragons are supposed to look. So my task will be to make these heads consistent with the descriptions in the game, while reserving some of my own artistic license. I’ll talk about all this as the project moves along. First, the very basic, basic start. 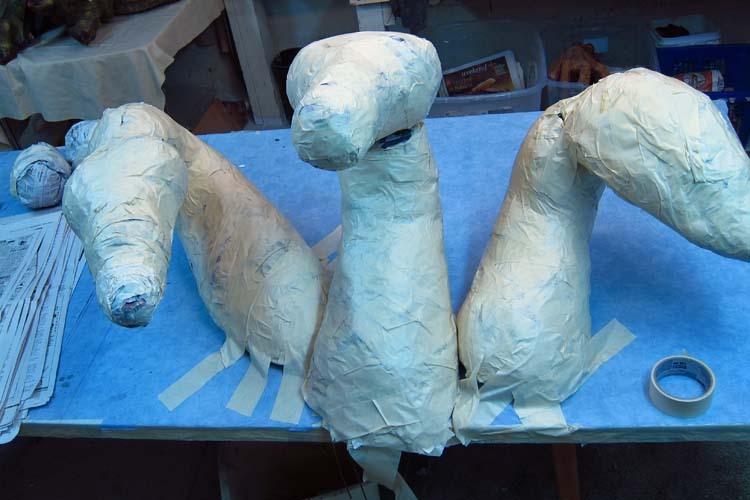 At this point it is just about making the paper mache pieces that I will use to sculpt. I never worry too much about precision at this stage. It’s about getting a sense of size and composition. Since everything is “times 5” with this project, I ended up with a large stack of crumpled balls. 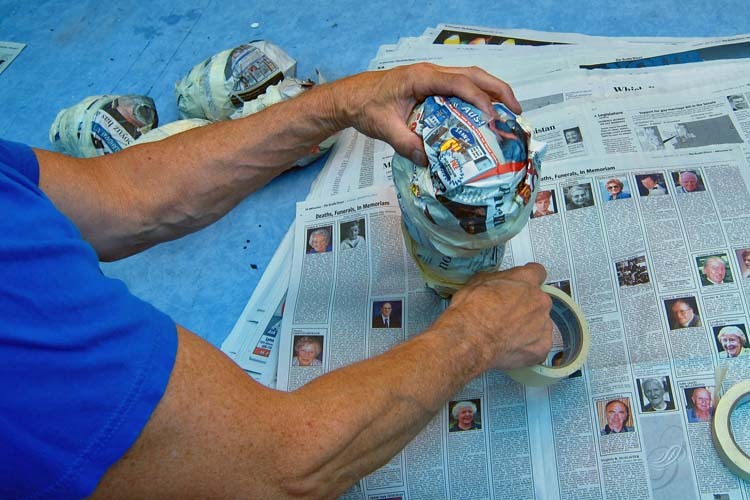 Once I had a few balls crumpled I started putting them together to make the neck of the first trophy. I decided that I would start with a row of three heads. On the left will be the black dragon. In the middle will be the red, and the white dragon will be on the right. I like the idea of black and white on either side of the red. In fact, after reading about these dragons, the red seemed to be the most aggressive. So I figured that he should take center stage. I have a defined size to work within. I’m trying to stay within a four by four foot space. And it shouldn’t extend out from the wall more than about two feet. I added the green and blue dragon heads above the row of three (green on the left). In its roughest form, here is how I want the heads to be configured. 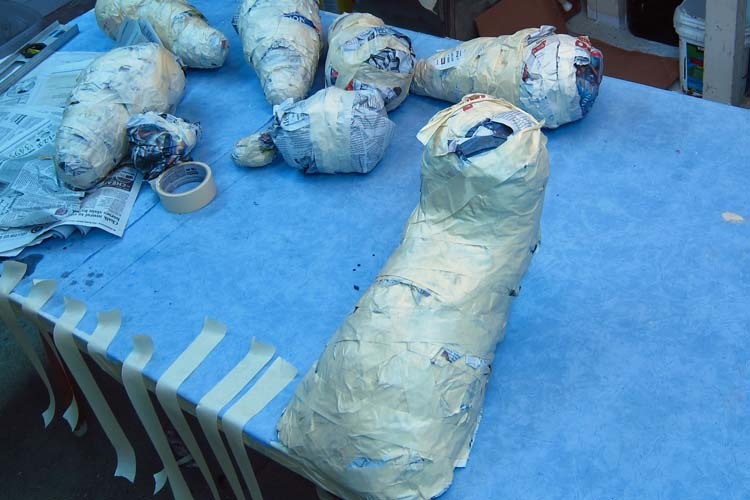 I took a lot of this apart before adding the paper mache (for reasons I’ll tell you about later). I also crumpled a few more balls. 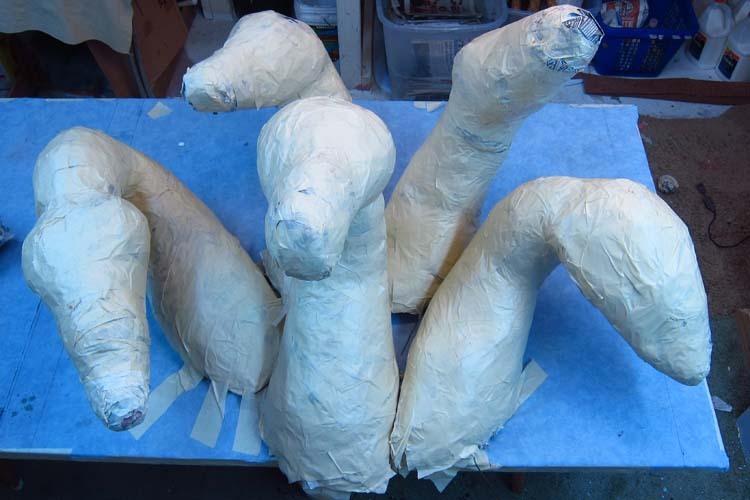 I will use their paper mache shells for sculpting later. 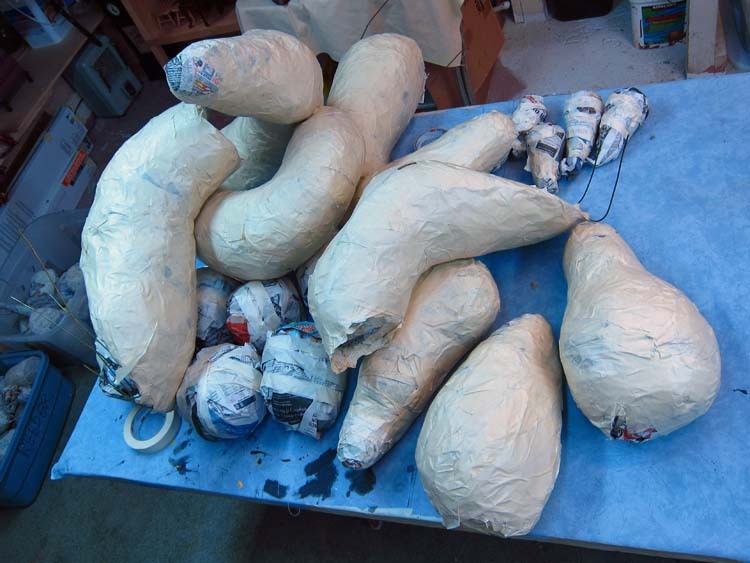 I will leave you with this pile of pieces ready for the paper mache. More later. Thank you as always for your patience! 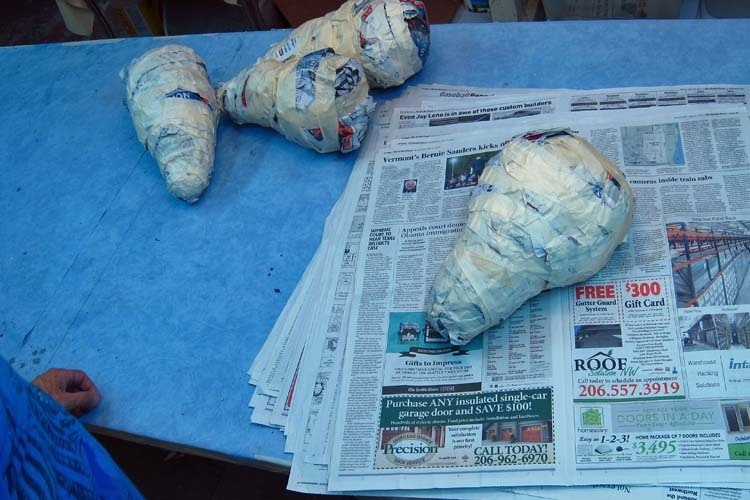 This entry was posted in Tiamat Dragons and tagged arts and crafts, cloth mache, dragons, mixed media, paper crafts, paper mache, paper mache instructions, paper mache recipes, papier mache, papier mache recipes, sculpture. Bookmark the permalink. It looks like a great project and I am looking forward to see more as you progress. Thanks Bob. I’m glad you are watching! Sounds like a really cool project Dan. I like where you are going with it and look forward to seeing how it progresses. They certainly picked the perfect expert to build them a creation that will draw people’s attention from miles around. That’s nice of you to say David! We’ll see if they like it when it’s done. I’m sure their customers will be picky. The customers will be LUCKY to have a dragon trophy made by you! Rowrr!! They seemed very happy that I would make this for them. I’ll try to get another post up today. Thanks. Super cool, can’t wait to see how it progresses! Hi Jennifer. Thank you for the nice comment! This will be a mammoth project but true to form of your artistic creations. All the bits will be X 5..whoa big project. Can’t wait to see it come along. Thanks Ralph! Yes, it will be a challenge. But that’s precisely why I wanted to make it. I appreciate you stopping by! I build custom die cast cars & I will take on a project that no one else would try, like you it’s a challenge. BTW the final always looks like what I had in my head. We definitely share the same approach to art! Thanks for sharing! Your work amazes me! I can hardly wait to see this 5-headed dragon. I know it will be GORGEOUS! I appreciate your confidence Nina! Thanks! New season starts here!! I’ve been really missing your posts, and I’m sure I’m not the only one! Really looking to this project, no doubt is going to be sick. Hey Nacho. I hope this will be worth the wait. Nice hearing from you! Nice start Dan. Did they give you a deadline to finish this project? If so, I hope it was enough time for such a large undertaking. Can’t wait to see it done. I love all your work. Hi Ladylynne. They were very generous with the deadline. They know how labor intensive it is. Thanks for the nice remarks. Looks like another amazing piece of art. Thanks for sharing! Thank you Willow! Glad you like this so far. I can already see that this is going to turn out great, it’s good to challenge yourself every once and awhile, I can think of no better way than this to do it. Also, I forgot to congratulate you on getting over 42 thousand subscribers on YouTube thats a big achievement, so congratulations! Thanks Grumpmeister! Your support is always welcome! Rowrr!!! Fancy, complicated dragon work! Goood!! I pester Mom to make me a gargoyle or other mache friend, but she’s been off on a blues harmonica tear, instead. She says to say, “Hi,” though. Exciting! I’m really interested to see where you go with this project, how you interpret the Tiamat dragon, and particularly how you unify the five heads into a coherent whole. I know the result will be excellent. Hey Stella. You know, I’m cheating a little. There is a lot of art out there depicting these dragons. The best, in my opinion, is the the official Dungeons and Dragons wallpapers (owned by Wizards of the Coast). I’m taking my lead from that art. I’ll add those in my next post so you can see. Thanks as always for stopping by! Can’t wait to see the finished product at The Chromatic Dragon! Everyone is so excited about it. Thanks Anna! I appreciate your confidence! What a lot of work! Only you can pull this one off. This is going to be amazing. It will be worth the wait! Hi Lori. Thank you as always. I appreciate your confidence. I’m very happy with what I have so far. I’m spending so much time on it that it’s hard to get the posts written. I swear I’ll get another out today some time. Hope all is well with you.